The world of oral healthcare is never standing still, and our doctors at Atrium Family Dental strive to stay right at the cutting edge of new developments. By using state-of-the-art technology throughout the care process, we can make our patients’ visits faster, more comfortable, and more precise. Keep reading below to learn more about the hi-tech touches you’ll see here in New Lenox, or contact us today to schedule a visit. Why Choose Us for Advanced Dental Technology? Have you ever felt a little left in the dark as the dentist peers into your mouth during a checkup? 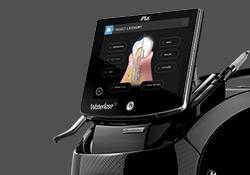 Intraoral cameras go a long way towards providing valuable, educational insight and strengthening the partnership between patients and team members. We’ll start by moving a camera-tipped wand around the teeth and gum tissue, capturing images that are immediately transferred to a TV monitor in the operatory. Your smile will be on the big screen in crystal-clear detail, which means that we can refer to it at any point when discussing problematic findings, potential treatment plans, and much more. 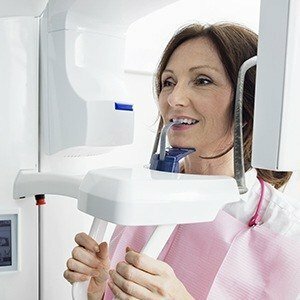 The Atrium Family Dental team strongly recommends that everyone receive a full set of dental X-rays each calendar year, and we use digital radiography to make this process easier and safer than ever before. Instead of having to wait hours for the photos to develop in a darkroom, these high-resolution X-rays are available for viewing in mere seconds on our computer system and can even be digitally manipulated to improve patient comprehension. Environmental waste and radiation exposure are reduced to a minimum as well. 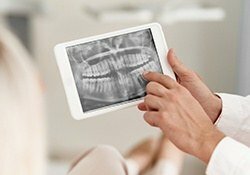 Digital X-rays are a crucial part of high-quality dentistry, but they’re not quite showing the whole picture. 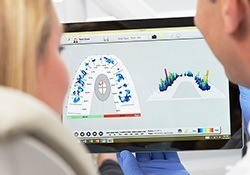 When arranging advanced treatment plans like surgical dental implant insertion or root canal therapy, our dentists want to proceed with unparalleled confidence – that’s why we use a state-of-the-art Cone Beam, which creates comprehensive, three-dimensional guides of the patient’s oral structures. 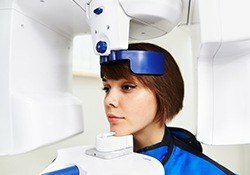 Even the smallest anatomical details are mapped out precisely, which means we can avoid unexpected “surprises” and leave patients with highly successful results. Dental lasers are quickly becoming widespread in the field of dentistry, and it’s not hard to understand why. When compared to traditional scalpels, they make periodontal treatment, implant dentistry, and even teeth whitening, more comfortable, more efficient, and more precise than ever before. The laser’s focused beam eliminates and sterilizes infected tissue while also minimizing bleeding, eliminating the need for sutures. Patients can also expect to recover on a much faster timeframe overall. The development of tooth decay is a gradual process – the earlier our dentists can stop it, the better. 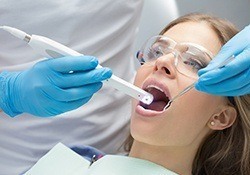 That’s why we’ve chosen to invest in DIAGNOdent, which uses laser fluorescence technology to detect weakened enamel throughout the mouth and pinpoint cavities that may not even be visible to the naked eye. This advanced preventive approach results in less invasive restorative treatment and more successfully preserved dental structure.